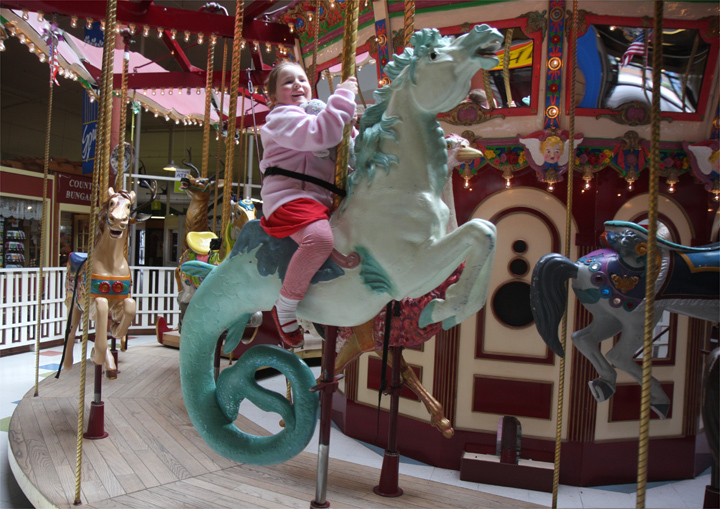 But few shopping malls have the attraction of the Seaside Carousel Mall – a full-sized indoor working carousel. On the Oregon Coast, being indoors means you can enjoy a ride on a horse, sea horse or any number of other animals depicted on the spinning wonder. Deshon, who has been managing the mall for the past 17 years says that the 20 shops inside the mall rarely change – and that the mall has become a destination for people not only wanting to shop, but show the kids a good time as well. From an old-time portrait studio, to a soda fountain, to a toy store, to a leather store, and even a custom hat store, there really is something for all members of the family. The mall also features several places to eat, with different cuisines and even has a coffee shop for those looking for a pick-me-up. “We have a wonderful mixture of things for the family to do,” Deshon says. The mall, located along the main street in Seaside that ends at the promenade and is lined with restaurants, candy shops and even a full arcade, has an old-fashioned feel. The carousel features 22 animals with several of them not being horses, but instead cats eating fish, a giraffe and a pig. The carousel is based off a carousel the owners saw in San Francisco and the horses and other animals are taken down regularly for repainting and maintenance. Rides are very affordable, and being indoors, means that the mall is open year-round. Which is great for those who want to come out and storm watch or even see the rare snow on the beach. About the Seaside Carousel Mall: Located in the heart of Seaside, the mall features a working carousel with about 22 animals. The indoor carousel and mall is open year round and has an eclectic group of shops and restaurants. What to bring: Photography is allowed and the operator of the carousel will even stop and allow you to get the perfect shot of your child on the animal they have picked out. Bring your wallet, because there are a lot of really fun shopping opportunities – I came away with three custom made hats. Season: The mall is open year round and there are different hours for each season. Summer is the busiest season, so waits to get on the carousel, or space in the shops may be limited. Since it is indoors, there is no reason you can’t enjoy the attraction in the Fall or Winter, as there are fewer people. Getting there: Take Highway 101 to Broadway Street in Seaside, the carousel mall is two blocks from the beach and located right on Broadway. Tips: If you don’t like huge groups of people, then visiting the mall and carousel during the week is the way to go. During nice weekends Seaside fills up with not only tourists, but locals looking to have fun at the many attractions on Broadway Street and the promenade along the beach.